During the melting season I'm writing (bi-)weekly updates on the current situation with regards to Arctic sea ice (ASI). Central to these updates are the daily Cryosphere Today sea ice area (SIA) and IJIS sea ice extent (SIE) numbers, which I compare to data from the 2005-2014 period (NSIDC has a good explanation of sea ice extent and area in their FAQ). I also look at other things like regional sea ice area, compactness, temperature and weather forecasts, anything of particular interest. We are now entering the final weeks of the 2015 melting season. A relatively cold and cloudy start (not as cold and cloudy as the two previous rebound years) was compensated by a July that was ideal for melting. A continuous bombardment of heat and sunshine for weeks on end has caused some late melting momentum which is now keeping sea ice extent and area numbers dropping relatively evenly, despite a switch in weather conditions since the beginning of the month (see ASI 2015 update 5: late momentum). As expected, the 2015 trend line on most graphs is hovering between top 3 years 2012, 2007 and 2011, and rebound years 2013 and 2014. It's difficult to tell how low things will end up. Melting momentum is one thing, but at this stage of the melting season weather conditions have the last word. It's compaction rather than melting that determines the final shape of the ice pack, and compaction depends on which way the winds are blowing, which in turn depend on the constellation of cyclones and anti-cyclones, or high pressure areas. See this blog post from an eternity ago, 2010, that explains how it works. During the melting season I'm writing (bi-)weekly updates on the current situation with regards to Arctic sea ice (ASI). Central to these updates are the daily Cryosphere Today sea ice area (SIA) and IJIS sea ice extent (SIE) numbers, which I compare to data from the 2005-2012 period (NSIDC has a good explanation of sea ice extent and area in their FAQ). I also look at other things like regional sea ice area, compactness, temperature and weather forecasts, anything of particular interest. The slow start I reported on in the previous update has continued, but as always in the Arctic there is more than meets the sensor. The slowness shows itself mostly in the area and extent numbers (changing as we speak), and the main culprit is that cyclone that refuses to go away. I initially said this would be a relatively small cyclone, and even called it the Small Arctic Cyclone of 2013 in one of the two posts I devoted to it since the last ASI update, as a tongue-in-cheek reference to the Great Arctic Cyclone of 2012 (GAC-2012). But you know what? It ain't that small, and what's even more interesting: it just won't go away. For over two weeks now it's been keeping things colder and cloudier over the central Arctic, but at the same time it's been shaking and stirring the ice, wherever it passes. Not to the point that it makes the ice disappear - this isn't August, most of the ice is still thick enough -, but it is showing how mobile the ice is, ripping holes in the ice pack that close up again once the storm has passed. It reminds me a bit of the 2010 melting season, when large regions with holes showed up in the middle of the ice pack. So this cyclone is the big news of the melting season so far. Here's the rest. Cryosphere Today sea ice area data had the trend line of 2013 way above all the others at the end of the month, but it seems that the limit has been reached. After a century break a couple of days ago a very big drop of almost 250K was reported today for June the 6th. ASI 2012 update 11: end or beginning? During the melting season I'm writing (bi-)weekly updates on the current situation with regards to Arctic sea ice (ASI). Central to these updates are the daily IJIS sea ice extent (SIE) and Cryosphere Today sea ice area (SIA) numbers, which I compare to data from the 2005-2011 period (NSIDC has a good explanation of sea ice extent and area in their FAQ). I also look at other things like regional sea ice area, compactness, temperature and weather forecasts, anything that can be of particular interest. daily updated graphs, maps and live webcam images. I left for a vacation after all the records had been broken and have returned just in time to see all the minimums get hit on the various graphs. In the past couple of years the National Snow and Ice Data Centre in Boulder, Colorado, has built up a well-deserved reputation of being the number one source of information when it comes to Arctic sea ice. When they called the minimum three days ago, it was picked up far and wide by news agencies around the world, an even better response than when all the records started to break one by one a little over a month ago. I remember well the excitement I felt around this time in 2010 and 2011, checking all the graphs and satellite images every hour, trying to predict when the melting season would end. But none of that this year. Maybe it's because I still feel overworked, despite my vacation. Maybe it's because the records were broken so early in the season, preceded by several spectacular events. Maybe it's because this melting season was so freakish that it was practically impossible to pinpoint the minimum a few days in advance. All those factors play a role, but what I think is going on, is that this stunning melting season has made me even more acutely aware of the gravity of what is taking place. 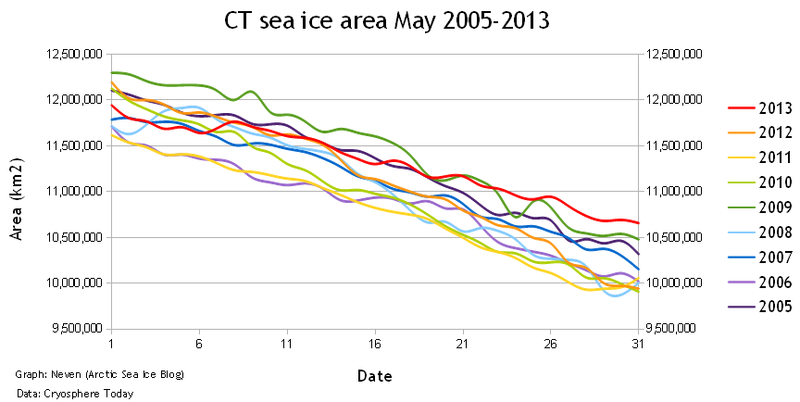 This melting season has provided the final and definite confirmation that the ice is thin, PIOMAS has it largely right, and I have a very hard time finding indications that this is going to turn around real soon. To be able to watch and write about the Arctic sea ice, I used to block out the realisation of risks, so that I could make a joke here and there and be scientifically reticent in my own amateur way, keeping up appearances, acting objective. But my bubble has burst. I'm already watching past the minimum. As the melting season ends, it feels as if things are only beginning. The age of consequences. On September 16th the trend line shortly dipped below 3.5 million km2, reaching a minimum extent of 3.489.063 square kilometres. That's more than three quarters of a million below the 2007 record, and more than a million below 2011. I knew that there was a good chance the record would be broken this year, but never imagined it would be by such a large margin. Especially not with circumstances that in many ways were the opposite of those in 2007. Basically, I'm at a loss for words, and not just because my jaw has dropped and won't go back up as long as I'm looking at the graphs. I'm also at a loss - and I have already said it a couple of times this year - because I just don't know what to expect any longer. I had a very steep learning curve in the past two years. We all did. But it feels as if everything I've learned has become obsolete. As if you've learned to play the guitar a bit in two years' time, and then all of a sudden have to play a xylophone. Will trend lines go even lower, or will the remaining ice pack with its edges so close to the North Pole start to freeze up? Basically I have nothing to offer right now except short posts when yet another of those record dominoes has fallen. Hopefully I can come up with some useful post-melting season analysis when I return from a two-week holiday. I'm at a loss at this loss. The 2007 record that stunned everyone, gets shattered without 2007 weather conditions. The ice is thin. PIOMAS was/is right. I had to adjust the Y-axis on this graph already once (compared to the one in the last ASI update), and it looks like I'll have to adjust it again. I already announced the new IJIS SIE record minimum yesterday, although it was based on the preliminary number. But after the revision the record is still standing and IJIS still hasn't stopped producing century breaks. There are several scientific organisations that keep an eye on the Arctic sea ice cover and put out graphs to inform us of the amount of ice that is left. You can see most, if not all, of them on the ASI Graphs webpage. I expect the record on most of these graphs to be broken in weeks to come. The data on this graph has been the source of a recurrent discussion on the ASI blog, revolving around the question: Was a plateau of around 2.3 million square km reached in 2007? This year might give us a clue. The trend line has already surpassed 2.25 million square km, but maybe things will level off now. Or it could dip below 2 million square km. We'll know in a few weeks, but either way, this is yet another record that was broken this year.